Polar mesospheric clouds in the Northern Hemisphere are featured in this image photographed by an Expedition 31 crew member on the International Space Station. In both the Northern and Southern Hemisphere, during their respective late spring and early summer seasons, polar mesospheric clouds are at the peak of their visibility. 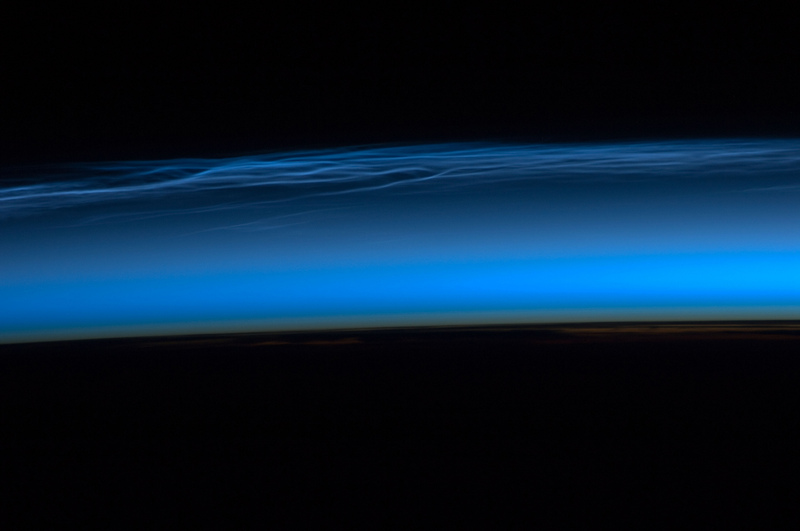 Visible from the ground during twilight, aircraft in flight, and the International Space Station, they typically appear as delicate shining threads against the darkness of space—hence their other name of noctilucent or “night-shining” clouds. On the same day this image was taken from the space station while it was passing over the night-darkened Tibetan Plateau, polar mesospheric clouds were also visible to aircraft flying above Canada. In addition to this still image, the space station crew took a time-lapse image sequence of polar mesospheric clouds several days earlier (June 5, 2012) while passing over western Asia; this is first such sequence of images of the phenomena taken from orbit. Polar mesospheric clouds form between 76-85 kilometers above the Earth’s surface, when there is sufficient water vapor at these high altitudes to freeze into ice crystals. The clouds are illuminated by the setting sun while the ground surface below is in darkness, lending them their night-shining properties. In addition to the illuminated tracery of polar mesospheric clouds trending across the center of the image, lower layers of the atmosphere are also illuminated; the lowest layer of the atmosphere, the stratosphere, is indicated by dim orange and red tones. While the exact cause of formation of polar mesospheric clouds is still debated—dust from meteors, global warming, and rocket exhaust have all been suggested as contributing factors—recent research suggests that changes in atmospheric gas composition or temperature has caused the clouds to become brighter over time.